With this third volume John Gill brings to a close his magisterial study of the war between Napoleonic France and Habsburg Austria. The account begins with both armies recuperating on the banks of the Danube. As they rest, important action was taking place elsewhere: Eugene won a crucial victory over Johann on the anniversary of Marengo, Prince Poniatowski’s Poles outflanked another Austrian archduke along the Vistula, and Marmont drove an Austrian force out of Dalmatia to join Napoleon at Vienna. These campaigns set the stage for the titanic Battle of Wagram. Second only in scale to the slaughter at Leipzig in 1813, Wagram saw more than 320,000 men and 900 guns locked in two days of fury that ended with an Austrian retreat. The defeat, however, was not complete: Napoleon had to force another engagement before Charles would accept a ceasefire. The battle at Znaim, its true importance often not acknowledged, brought an extended armistice that ended with a peace treaty signed in Vienna. Gill uses an impressive array of sources in an engaging narrative covering both the politics of emperors and the privations and hardship common soldiers suffered in battle. Enriched with unique illustrations, forty maps, and extraordinary order-of-battle detail, this work concludes an unrivalled English-language study of Napoleon’s last victory. John H. Gill (Jack), a military historian specializing in the Napoleonic era, is the author of With Eagles to Glory and the editor of A Soldier for Napoleon. He has contributed numerous papers to the Consortium on the Revolutionary Era and other academic forums. 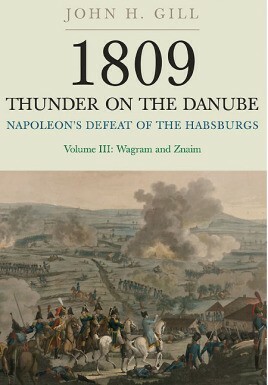 His latest work is 1809: Thunder on the Danube, just published in March 2008, which is to be the first of three volumes.An associate professor at the Near East-South Asia Center for Strategic Studies in Washington, DC, he has also published on military history and contemporary security issues relating to India, Pakistan, and other South Asian countries.A retired US Army colonel, he lives in Virginia, USA with his wife, and their two teenage sons. “…sheds new light on well-known stages in the battle…he has covered more than just an epochal battle in a magnificent book that will satisfy the most avid enthusiasts of Napoleonic era military history.